THE Kingston College soccer team which romped to victory in the Manning Cup and Olivier Shield competitions last year face their sternest test ever tonight at the National Stadium. They meet the Trinidad All-Colleges team with four National players at 8.00 in the opening match of a tour sponsored by the Jamaica Mutual Life Assurance Society and promoted by the Kingston College Old Boys Association. Although schoolboy competitions ended several months ago all but two of the Kingston College team have been playing regular competitive soccer in Senior competitions. And it is the members of Cavaliers the leading Division 1 club in the island — Lloyd McLean, Neville Oxford and Franklyn Morant who hold the key to the outcome of the match tonight. McLean, a Jamaica representative in the World Cup competition is a seasoned player and invariably reserves his best performances for visiting teams. The short, stocky player is the best inside left in the island—tirelessly attacking, defending, passing and shooting. Outside right Neville Oxford is the explosive type of player who can win a match with one electrifying run and a single devastating shot. If given even a little room to move about Oxford's runs down the wing could bring the Trinidad defence to grief. Morant the KC centre half tackles a bit too quickly at times but if he settles down tonight the star-studded Trinidad front line will have trouble in passing. 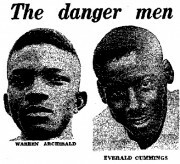 Three other KC boys — members of Railway will also be dangerous to Trinidad. Trevor Harris the centre forward who kicks accurately with both feet. Mickey Vernon the constructive and tireless wing half and Dennis Johnson at right back, quick, intelligent and seemingly omni-present. But the Trinidad coach Americo Brunner is confident that he has the formula to solve any problem KC are likely to present. Key man in the formula is 17-year-old "wonderboy" of Trinidad soccer Everald Cummings who the experts have hailed and soccer fans dubbed "Young Pele". Selected to play for Trinidad at 16, Everald toured Jamaica last year with the Trinidad team which was soundly whipped by Jamaica at the National Stadium but he has matured considerably since then. The clever inside right played with the National team against the Brazilians on their recent tour. Kenney Joseph the fast, powerful centre forward whose shot is his main asset is also a representative of the National team. Joseph the bustling type can give any defence a lot of worry. But the men whose performances might excel even Cummings is outside left Warren Archibald who performed creditably against the Brazilians for Trinidad. His football it is said at times reaches a high degree of subtlety and imagination. Half back Earle Fough is yet another member of the Trinidad National team, his forte is energy and constructive play.